I’ve finally had my portrait done. Phil S. (not the Phil of Haiku fame…this Phil is my Mad Libs buddy) sent me this image in an email. 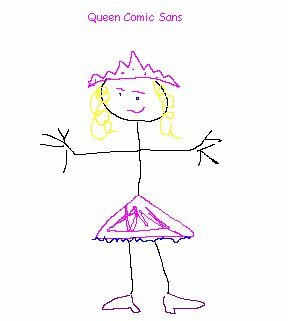 Knowing my love of art and of comic sans, he drew this picture of me and sent it post-haste in an email. It’s almost as if he looked directly into my soul! voulez-voulez-vous all hail the Queen. The Collective’s ThinkGeek Haiku Submittal. >I don’t wanna look at your stupid Tron guy.